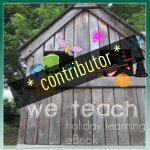 The We Teach Holiday Learning ebook is out and is available as a free download. There are over 30 ideas for holiday learning-- featuring holidays through the entire year. I submitted a Valentine's Day activity. There are crafts, cooking, learning activities, play activities and more for nearly every holiday. It's a great resource and it's free for we teach members. You can also find all of the ideas from the ebook on this Pinterest board.
. We teach is a forum for parents and teachers to share ideas. 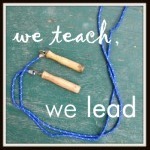 I'm also super excited today because I'm going to start co-leading the we teach: we're bloggers group. I've been participating in this group for about a year. I have learned so much from the members of this group and from Rachel Miller of Quirky Momma, who previously led the group. I still have so much I want to learn about blogging and so much I want to do with my blog. I'm excited to learn from the members of the group. I'm also excited because I get to collaborate with another blogger, Carolyn, to co-lead the group. I just discovered Carolyn's blogs. She has massive amounts of teaching experience and she share all sorts of free resources. If you aren't a we teach member, you might want to consider joining. We teach has over 3,000 members. The membership consists of people who are teaching professionally in the classroom, homeschool moms, stay at home moms (like me), and more. If you are a parent or a teacher, you will probably find some way to connect at we teach. There are groups for we teach music, we teach first grade, we teach two year olds, we teach reading and writing. There really is something for everyone. If you're a blogger, consider joining the we teach: we're bloggers forum. It is a very supportive community, every week Michelle of Beginning Reading Help leads up a discussion called Weekly Blogger Share. Bloggers in the forum do an amazing job at reading each other's blogs and encouraging each other. We teach is also on facebook. You can follow we teach updates with the hashtag #weteach on twitter as well or check out the weteach group list on twitter. We've also recently branched out to pinterest. You can find many of the lovely members pinned on this one board! I hope to see all of you over at we teach!